Phase One A-Series with 23mm Alpagon lens, f8 @ 0.5 seconds, ISO 50. 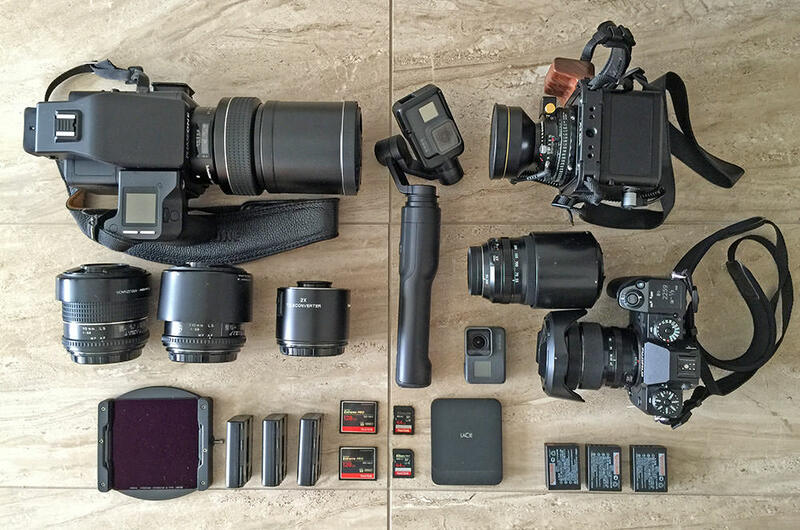 So, what's in my current camera bag? It really depends on the job at hand and what I want to photograph. On a landscape shoot, like the one Tony Hewitt and I did in SWUSA in February - and the Canadian Rockies you could join us on this October - my focus is on a medium format outfit, with smaller cameras for behind-the-scenes and video. Shooting the landscape for me means my Phase One 100MP system, but for most readers, it is more likely to mean a Canon EOS 5DSR, a Nikon D850 or Z7, or a Sony A7R III. Of course, we're in a wonderful era when we have more megapixels than sense and a 20-megapixel sensor is still going to produce amazing quality. I used to have pixel-envy back in 2001, wishing I could afford a 20-megapixel Sinar back. You don't need to have pixel envy as practically everyone has this image quality today! Shooting medium format for me does require compromise. I don't have as long a focal length as I'd like. I have heavier cameras than I'd like. I choose to take a second camera system for BTS and video work, which I might not need if only I shot with a DSLR or mirrorless camera. However, the file quality I produce with my medium format is second to none and that's what drives me when it comes to landscape photography. I can slow down and take my time to get the images that matter to me. For other trips, like the one I'm on right now in Iran, my choice of equipment is slightly different because what I'm photographing is different, but today we're talking about landscape photography - so here's what I took on my last trip. Top left is the Phase One 100MP Trichromatic with the Schneider 240mm mounted. It is surprising how often this is the lens I use for landscape shots when travelling on the road. Below it are a 55mm, 110mm and a 2x converter. In the middle is a GoPro Karma which works well if the camera sees the USB connection. I bang it if it doesn't! Top right is the Phase One A-Series 100MP with a 23mm ultra wide-angle lens (like a 16mm on a full-frame DSLR). You can't get this wide a lens on the XF. Below this is a Fujifilm X-H1 with 10-24mm and 55-200mm zooms, chosen for their video performance on this occasion. Other bits and pieces include an extra GoPro for the pocket, NiSi filters (ND 6x, 10x and 15x), spare batteries, Sandisk memory cards and the tiny LaCie SSD drive. I don't think you should look at this outfit and think you need two systems. I have two purposes these days: taking (hopefully) great photos, but on workshops I'm also collecting material for marketing, hence the interest in video. And I must say, I'm really enjoying the challenge of creating better videos. I've always had a great appreciation for the cinematic arts, perhaps even more so now!